Toucan crossing definition is that ‘two can’ cross at the same time; cyclists and pedestrians. This along with the fact that all UK pedestrian crossings are named after animals, the name Toucan Crossing was suitably applied. Besides the Toucan Crossing, other types of UK pedestrians crossings requires that a cyclist should dismount before crossing for their own safety and the safety of others. The Toucan Crossing design is much wider than other typical crossings allowing cyclists to ride safely across by using entrance lanes, plus possibly dedicated lanes whilst crossing the road that merge into exit lanes. Although during a driving test the examiner will not ask you any questions other than the Show Me Tell Me questions, it is still in your interest to try and establish what type of crossing it is you are approaching. By establishing this, it will help you predict possible hazards and dangers in advance, which after all, is a major part of your safe driving career. As always during a driving test, you should be looking well ahead for any suggestion of potential hazards. Any pedestrian crossing, including the Toucan crossing is a potential hazard. 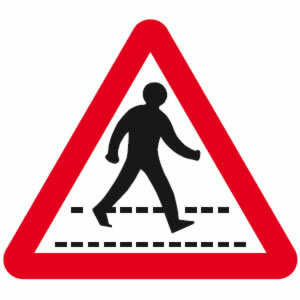 There are no dedicated signs to suggest a Toucan crossing is ahead although there may be a general pedestrian crossing sign such as illustrated in the left column of this page. As the crossing nears, look for road markings. Are there multiple lanes on the crossing and does the crossing appear to be much wider than a typical crossing? If yes, it is likely to be a Toucan crossing. If in busy traffic, take the extra width of the Toucan crossing into account to ensure you do not stop on the crossing if a vehicle in front of you stops the other side of the crossing. Look also for waiting pedestrians and cyclists. If cyclists are waiting and are still mounted, it will likely be a Toucan crossing. If the pedestrians have been waiting for a long period of time, the chances are the lights will change before you have passed the crossing, so be prepared to slow down and stop. From a distance, especially in low light conditions, you can see the ‘wait’ sign on the yellow box illuminated for some distance away. This can provide you with a clue that the lights may change before you cross. On the approach to any hazard, including a crossing, the examiner will expect you to check the rear view mirror. This is to establish what is behind you and how close. If a vehicle is driving close behind you and you feel it is likely you will need to stop at the crossing, you may need to gently slow down sooner than usual to give the vehicle behind more time to react to your slowing. If however the crossing is completely clear and you can clearly see there is no one waiting to cross, there is no need to slow your vehicle and you can continue at the current speed limit or safe speed for the road conditions. It is a offence to stop on any pedestrian crossing and block the way of pedestrians and cyclists attempting to cross the road. Such actions will certainly fail a driving test and potentially if caught by cameras or the police, may result in a fine. Remember Toucan crossings are significantly wider than other types of crossings so extra care is needed to avoid this. Identifying a Toucan Crossing on approach will help to avoid this as you will understand it will be wider. If the traffic is heavy and slow moving, allow the car in front to clear the crossing and to allow enough room for you to clear the crossing before proceeding across. A driver behind you may be impatient with such actions but stay firm and make them wait. 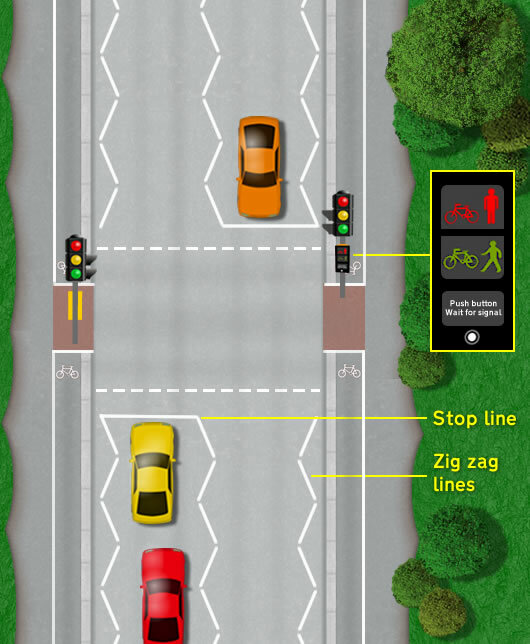 If the lights change to red and you need to stop, ensure you stop just before the stop line (see diagram above). Stopping even slightly over or on the stop line will likely fail your driving test. A driver or rider must not park their vehicles on the zigzag lines at either side of a Toucan Crossing (see diagram above). This is an offence and can result in a fine. The zigzag lines are in place to prevent parked vehicles from obscuring the view of crossing pedestrians, cyclists and also to allow drivers a clearer view of the crossing upon close approach. Steady amber lights located on a Toucan crossing warn drivers to start slowing their vehicles as they will need to stop. Zigzag lines located at either side of the road on a Toucan crossing are put in place to warn vehicles to not park within these areas. Parked vehicles in these areas obscures the view of both pedestrians and cyclists crossing the road and other traffic approaching the Toucan crossing. It is an offence to stop a vehicle on a Toucan crossing and impede the progress of pedestrians and cyclists attempting to cross. Certain Toucan crossing may have cameras located to detect such offences. Overtaking other vehicles on a Toucan crossing is not permitted. Overtaking cyclists is acceptable. Although not illegal, gesturing pedestrians or cyclists to cross by use of head lights or hand gestures should be avoided for safety reason and if done during a driving test is likely to result in a failure. It is illegal not to stop at a red light at a Toucan crossing. Certain pedestrian crossing have cameras that detect such offences. The Toucan crossing light sequence below illustrates what the driver will see at the same time as pedestrians or cyclists. Toucan crossings use the same sequence as those found on Puffin crossings. The steady amber phase of a Toucan Crossing signals drivers to prepare to stop. If whilst driving, you drive through a steady amber because you are close to the crossing, this is acceptable providing you do not drive through a red light at any point (even half way through crossing). A toucan crossing may or may not have a sign on approach to warn drivers. If a sign is present, a sign displayed for all pedestrian crossing types will be displayed such as the sign.